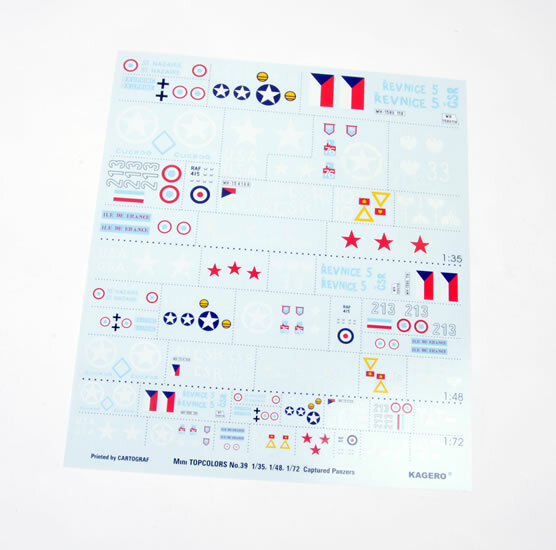 Advantages: Nice variety of colours and markings; decal markings supplied for all profiles in all three major scales. Panzer II F (US Tunisia); Skdfz 222 RAF Nth Africa; Hetzer (Polish Home Army); Panther A (French NWE); Sd.Kfz. 4 15cm Panzerwerfer (French NWE); Panther G “Deserter” (Canada/UK Italy); Panther G “Cuckoo” (UK NWE); Pz IVH/J (French NWE); Sd.Kfz. 251/8 D (US NWE); Panther G (USSR Hungary); Panther G “Dauphine” (French NWE); Sd.Kfz. 251/9 (UK Holland); Sd.Kfz. 251/1 D (Czech, Prague); Sd.Kfz. 250 Ausf A (Czech, Prague) and Stug III G (Polish, Poland). 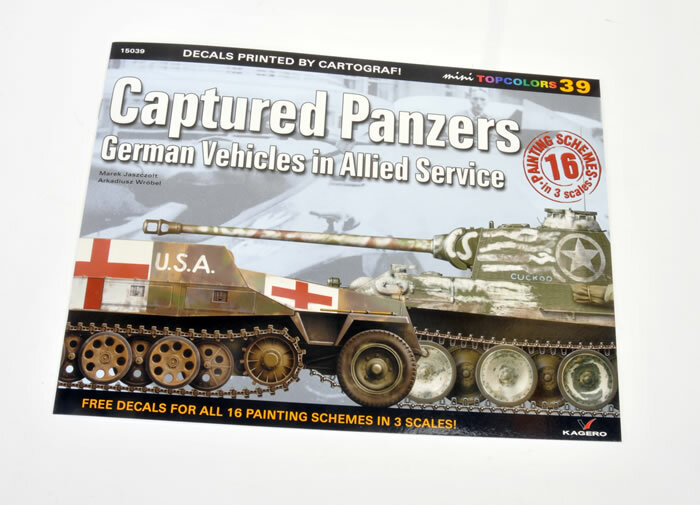 The decals appear to be well printed with little carrier film and cover an interesting array of subjects, most of which feature reasonably colourful markings. Each subject has a background and description in both English and Polish. Three scales are provided being 1:72, 1:48 and 1:35, along with slogans and numerals. A lot of the subjects are covered in whitewash and the information page gives some interesting notes regarding this and general Soviet schemes. This is a great collection of markings for an interesting subject not often seen. As such, it should appeal to modellers of Allied armour and those modellers of German armour looking for something different. If I have one criticism it is the Blue of the Guards Armoured Divisional and RA AoS insignia is way too light a blue, being Sky as opposed to Royal Blue. Despite that, I look forward to more subjects from this manufacturer.